I just (AUG 25) updated the Original Post to include direct download links to appropriate .debs. Let me know if there are any issues, and I will edit..
SolydXK's basic premise with SolydX (xfce) is to provide a lighter OS than SolydK (kde). But there are several XFCE users (myself included) who like it with more bling. These apps added to SolydX let you customize its appearance (and in some case function) more to your preference. There are several old threads for each individual item but they tend to get buried in back pages after several days. Most have been compiled and made into .debs by our own "zerozero" (thanks)..
Whisker Menu is now in the repo. Many fixes and other changes. 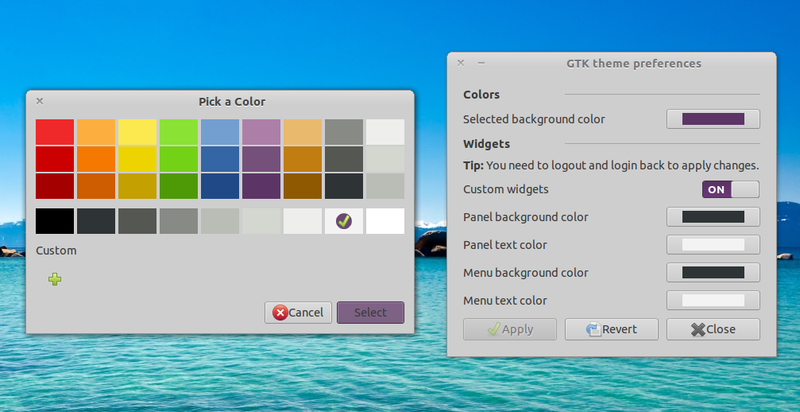 simple GUI to control the various Xfce4 WM tweaks that are not available via the "Window Manager Tweaks" control panel. These settings are available via the xconf settings editor but that is one of the most awkward GUI's I have ever used as you have to select the xfwm4 channel, expand the tree, scroll to the option you want, select it, click edit, change the setting and click save, then the tree gets collapsed and you have to start again! So this nice simple GUI to control the composite manager, the settings are self explanatory. All nice and worth using.. If anyone see any errors or bad link, or whatever. Let me know. I'll fix. I just updated the OP to include direct deb downloads. Something seems to be wrong with your dropbox link. I get an "error 400". Download is OK. Thanks again. Every install I do I have to go back, because my memory is gone. have installed the XFCE Theme Manager but now whichever wallpaper I install or choose is only in grey, no colors. Here's a little addition that you'll wonder how you ever did without. In Thunar, right-click any folder and get Find here in the context menu. - Edit|ConfigureCustomActions and hit + to create a new one. - Name: Find here, Description: KFindSU, Command: /usr/bin/gksu /usr/bin/kfind %F, and set the icon to a magnifying glass. (Hint: Action Items, System search. - OK and Close, and restart Thunar. Now anywhere you go you will have 'Find here', which saves tons of time and clicks once you get used to it. - Set Sub-pixel order to RGB. Now your text will be much clearer. Ever wonder which window that an icon in the Panel applies to? Now when you mouse over any app in the Panel, its outline will appear so you can see which one it is. That's about it for me and XFCE. I've now officially switched back to KDE after a year of experimenting with XFCE. It's nice and fast, but has limitations. (not being able to set owner:group in Thunar, really? Stand on your head, close one eye, and do contortions for pkexec?) Doesn't seem like there's any progress with it. Whups, spoke too soon. KDE doesn't work at all, running dolphin/kfm as root. Back to XFCE. Wouldn't this be better to sticky in the 'Xfce specific' forum/area.